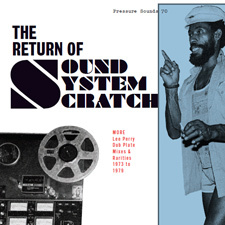 Due out on the 26th April is a second release of Lee Perry dubplates and assorted obscurities from Pressue Sounds titled The Return Of Sound System Scratch. Pressure Sounds will be rightly applauded for digging a lot deeper than many other reissue companies are prepared to these days and whilst this has produced a release of varying quality this will undoubtedly be an essential purchase for scratch fanatics and any one else who likes their reggae deep. Boasting three unreleased cuts and no less than eleven dub plate mixes this really is heavy duty stuff. Whilst I’m not a scratch expert and can’t verify the authenticity of the unreleased tracks these are certainly fine tunes and not the kind of thing that would have been best left on a long forgotten master tape. Some of the dub plates cuts are of varing quality with Longer Dub a dub mix of the classic Long Way by Junior Byles being particularly rough. Others may disagree but if that’s the only way we are to hear such tunes then I can live with it but all the same it’s hard not to wish for a cleaner copy! In days like these we can only be grateful that the guys at Pressure Sound have the courage and dedication to put together this kind of release. Long may they continue.